A Burma Army officer, two soldiers from both the Burma Army and its militia, the Border Guard Force, were killed by blast mines in the recent conflict area near Kyone Htaw Waterfall, Mae Tha Wor, Karen State, on November 22, 2016. The mine fatalities happened after months of intense fighting between the breakaway Democratic Kayin Buddhist Army (DKBA) and a combined force of Burma Army and BGF soldiers. 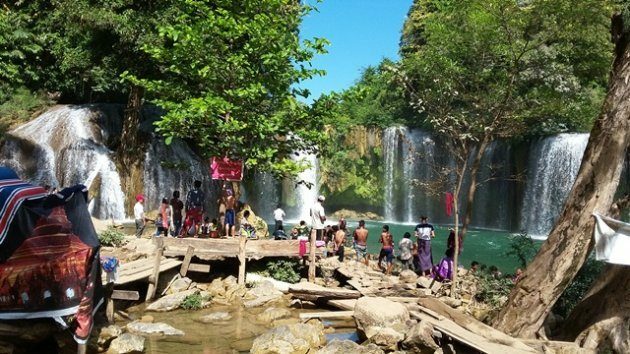 Ironically the deaths happened as the fighting had stopped and preparations were underway to re-open the popular Kyone Htaw Waterfall that closed for months during the fighting that started in early September, 2016. A BGF officer said that the mine incident that killed the three soldiers took place near a former DKBA camp at Wah Boe Mountain, west of the waterfall. The BGF officer said that the areas was a battle ground during the intense fighting and the mine might be a result of the conflict. Speaking to Karen News, the BGF officer, who asked not to be named, said. The soldiers killed by the mine were a Captain and private soldiers from Infantry Division 44 and a soldier from the BGF Battalion 1021. A village chief from Ahtet Kyone Htaw village had also stepped on a landmine and later died as he ran from the fighting on September, 15. As the conflict in the areas eases, mine clearance activities have been carried out around the Kyone Htaw Waterfall as the waterfall management committee, led by Abbot U Kaymi, are preparing to re-open the waterfall from November 25 for the holiday season. Visits to the Kyone Htaw Waterfall had been banned for public safety when the fighting started between the DKBA and BGF in early September, 2016. Although preparation to re-open the waterfall is underway, the areas is still a danger from landmines and pathways or road sides have displayed signposts warning of landmine danger. A survey on security concerns conducted in 222 villages in southeastern Burma 2014 found that 53% of villagers said they were affected by landmines. The survey was conducted by the aid delivery organization, The Border Consortium. More than 5,000 villagers that had been displaced due to the recent conflict in Mae Tha Wor areas of Hlaingbwe Township have not been able to return to their homes. There were reports of more new landmines being used in the armed conflict and this is one of the reasons that preventing displaced villagers from going back to their villages.